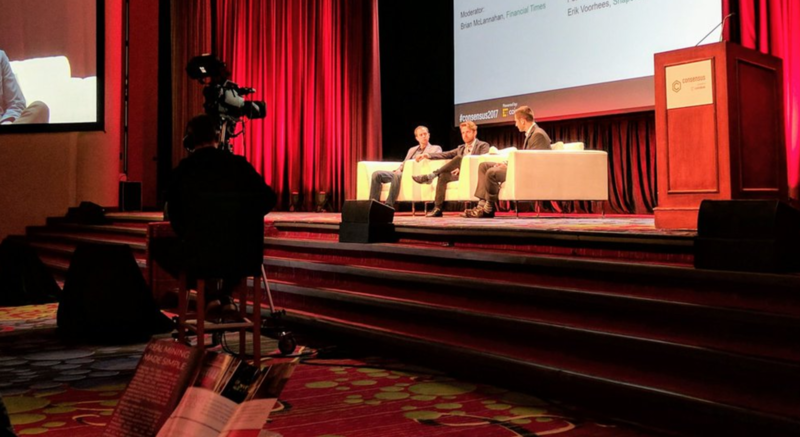 When ShapeShift CEO Erik Voorhees and Blockchain CEO Peter Smith took the stage this morning at CoinDesk’s Consensus 2017 conference, the title of their panel was already out of date. “Bitcoin Beyond $20 Billion: Digital Currency’s Future,” it read – but with bitcoin trading at close to $2300, the market cap of the currency is already $37 billion and climbing, according to the CoinDesk Bitcoin Price Index (BPI). During their appearance on the Consensus 2017 main stage today, both Smith and Voorhees shared their thoughts on why bitcoin is performing so well as an asset right now – and what we can expect from the future. The two perhaps have a unique vantage point to view the market: Voorhees runs a digital currency exchange while Smith leads one of the industry’s longest-running wallet offerings. For his part, Voorhees made the argument that market participants ought to brace themselves, and grow accustomed to a cycle of highs and lows. “People should expect bubbles with cryptocurrencies. They have been with us since the beginning of time and in crypto they are especially pronounced,” he said. But how high will it go? According to Smith, bitcoin has only two options: soar to great heights, or crash and burn. As might be expected, the topic of why the market is behaving the way it is emerged as a central conversation point. Smith threw out a couple optimistic views. It could be an indication that the functionality and usability of the currency is finally built out in a way that encourages adoption. Or, he suggested, bitcoin may be experiencing a secondary lift from the money that has been being plowed into token sales. Voorhees, on the other hand, refused to identify a single driver for the price. “Prices tend to move because hundreds of thousands or millions of actors are making millions of individual different decisions. And we don’t know what all those are. This is a complex system,” he said. Both, however, agreed that regulation will be one of the most determining factors that shape the extent to which bitcoin and the broader constellation of cryptocurrencies evolve. Voorhees for his part, called for a hands-off regulatory stance, holding up the Internet as a somewhat idealized example of unfettered innovation. “[The internet’s] only powerful and important because of the freedom it brought, because of how little it was touched by regulators. That was the best thing that happened to let the internet boom. And that’s what I want to happen with bitcoin,” said Voorhees, who also went on to dismiss the idea that anyone but billionaires could hold sway over regulators. But if bitcoin is to deliver financial inclusion across diverse markets and cultures, regulators will necessarily have a role, argued Smith.